It certainly does, and there are … lots of rocks. This photo rocks, Carin! I think there’s quite a community of Newfoundlanders in this area. I know there’s a fairly famous shop in Toronto or just outside, run by a Newfoundland woman, and which sells all things from The Rock. I understand it does an amazing business. I love this! 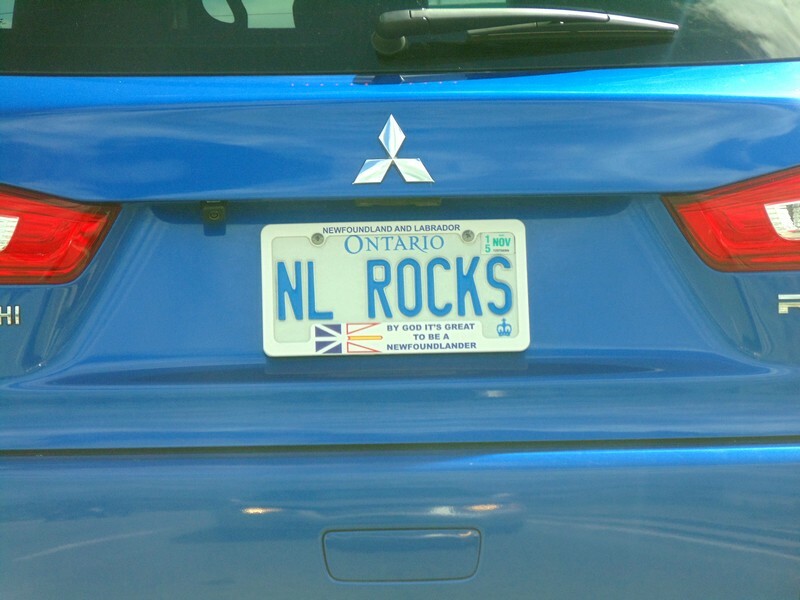 The irony of boasting about Newfoundland on your Ontario licence plate – cheeky indeed! I loved it for that very cheeky reason. And Exo of course. Thanks, Allison — I didn’t get the NL (thought Netherlands!!!) — (Which of course rocks as well.) But now I’ve enlarged the photo and see the boast, loud and clear! Other than that tho, lovely swooshy composition, the VERY clean car (jealous), the whole speaking of sassy pride! Oh, and it reminds me of seeing a long white Cadillac with just VIP on the vanity plate, pull up in front of a shop in West Vancouver; the blonde-meringue-haired passenger leaned out and emptied the car’s ashtray onto the sidewalk, and the car drove off! Obviously the VIP stands for Vile Icky Pratt.